The process of changing your legal business name or address can be complicated and include multiple steps. 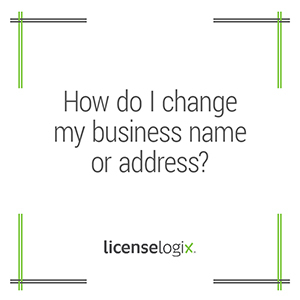 There is no streamlined way to change a business name or address, so you will have to make the adjustment with each different agency that your business is registered or holds a license. If your business is registered with the Secretary of State, then that is the first place to begin if you want to change a name or address. Every state requires a corporation or LLC to register with the Secretary of State prior to doing business in that state. Once registered, a business must keep the state informed of any changes to the name, address, registered agent, and owners of the business. In New Jersey, to change a business name and/or address, there is a $25 fee and a form that must be submitted. In California, businesses are required to submit a statement of information with a $25 fee. Most states require a company to have a registered agent when forming their business and in Texas, to change a business name or address, the registered agent must submit a general information form along with a $15 fee. For all other licenses and registrations, the process begins with finding the appropriate form and ensuring all the information is complete and accurate. Please note that states may have different forms for different requests (i.e. change of name form, change of address form, etc.) and the changes will not be accepted if an incorrect form is used. Many states require a nominal fee that must be submitted to the appropriate agency. Most states require these updates to be submitted within 30 days of the change. Some agencies will send out an updated license or registration in the mail showing the change. Others will only update their internal records. LicenseLogix can handle all aspects of your license portfolio from initial filings to ongoing compliance. We can help a business change their name or address with all the appropriate agencies. Once filed, we will follow up to confirm that the change has been made correctly. For additional help you can fill in the form on the bottom or give us a call at (800) 292-0909.